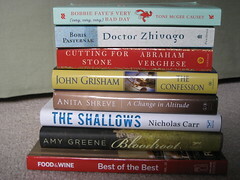 Ahh, the awesome stash of books I received for Christmas/birthday this year. If you need me, I'll be reading. Okay, to be truthful, I've already finished one of these books (hey, I got them over a week ago), and it was hilarious. Bobbie Faye's Very (very, very, very) Bad Day was a quick read and a lot of fun. (It has also been re-issued under the title Charmed and Dangerous, if you're interested.) It's very much in the vein of the Stephanie Plum/Spellman Files kind of book, which as you know, I love. So, yes, I will quickly be adding the next two books in the series to this pile. This is also the time of year when I usually do a quick recap of the books I read in the previous year. I was going to list them all, but I read 50 books in 2010, and that's a damn long list, people. (And it's 10 better than 2009!) I averaged almost a book a week, so I can't really complain. Of those 50, I'd say I liked two books that I've been sitting on for awhile the most -- Extremely Loud and Incredibly Close and The Amazing Adventures of Kavalier & Clay. I'm also pretty proud of having finished War and Peace, but I read the majority of that book in 2009, so I can't give it too much credence here. I also really enjoyed The Giant's House and The Thirteenth Tale, and 2010 was the year I discovered the Spellman series. I also got Grisham's latest - i hope you like it...let us know what you think! Extremely Loud and Incredibly Close is one of my favorite books ever! Melanie, I know this. I know this because you bought me the book. In 2006. Sorry it's taken me so long to read it. Ah, Kavalier & Clay. :) Good times. Put on your list: A Visit from the Goon Squad by Jennifer Egan. I absolutely loved it! I'm adding it as we speak! According to Good Reads, I only read 14 books last yar. I am shamed. I'm also sort of hoping that I maybe forgot to log a few but seeing as how I'm obsessive about that, I think I'm just deluding myself.